These mystic animal notecards were born of my obsession with Roxanne Coble’s stencils (trying to not sound like a fan girl) and always needing some extra cards laying around just in case. I like to make cards in bulk so that I’m never short for any occasion. You could also make a set of 6 and gift them to someone. This tutorial for these mystic animal cards are part of a fun blog hop with Tim Holtz and StencilGirl Products. 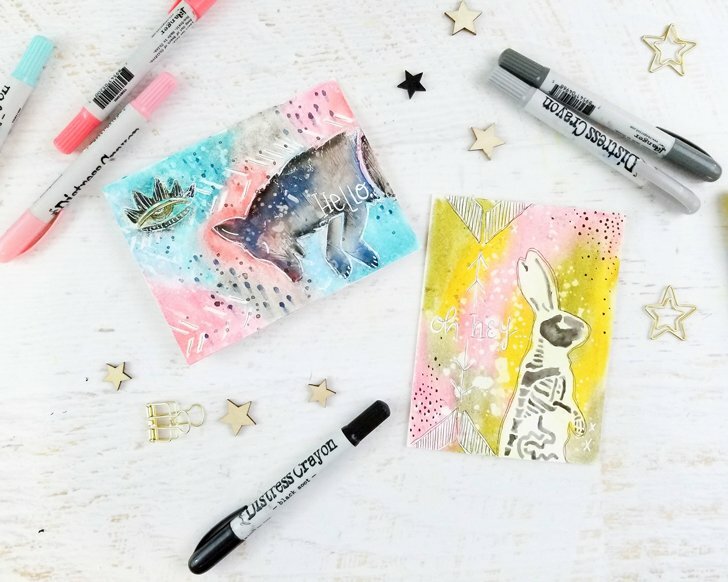 I love that these cards are a little bit mystical, a little bit whimsical and use Distress Crayons with some killer StencilGirl stencils in a few different ways. This blog hop was my first introduction to Tim Holtz products, even though I have seen them being used all over the art journaling community! I’m just slow at catching on 😉 So, if you’re tired of reading and just want to get on to the tutorial, then keep scrolling on! You can check out the entire StencilGirl Design Team’s posts below for this blog hop! Be sure to see what everyone is creating with each awesome Tim Holtz product like Adirondack Alcohol Inks, Distress Oxide Ink and more projects with Distress Crayons. To make this blog hop even more fun and amazing, One lucky winner will receive a $50 Gift Certificate to StencilGirl Products! Sign Up for The Scoop below for your chance to WIN! Winner will be announced on StencilGirl’s Facebook page on Wednesday, October 25th. Love these backgrounds! Thanks for the video! Aw I'm so glad Robyn! You have seriously inspired me. Beautiful cards! I have looked at these stencils so many times but was afraid I wouldn't really have a use for them. They look awesome on these bright fun cards!